Thanks for taking the time to check out Addanac City. I'll definitely work on some of your suggestions. I'm rather relieved you took it so well, especially since the review was not exactly positive. Don't give up though. Keep comicking! Practice is the best teacher you can have. Is "Addanac" Canada spelled backwards with and extra "d" in there or what? 'Cuz I thought so at first, but then there were some references to American football. If George is fearless about blunt reactions, he is 50 times more likely to succeed than someone who starts out decently but gets prickly when people comment. I enjoyed the review, and George's reaction, and I think if he keeps studying the results he will only improve. I have been having a chat about this issue on another webcomics blog the last couple of days, Mike Perridge's MPD57. ( http://mpd57.wordpress.com/ ) I can collapse my major point here, which is site design is graphic design and comics are cartooning, and not all of us have both skills. Yet in webcomics, both are very important! Mike argues that people with low graphic skills should go minimalist, and makes other good points -- some readers might want to browse the thread, it's not long. Again, I enjoyed reading this segment, especially since I am familiar with the comic, and because critical issues and a resolve to consider them were discussed in a professional, not emotional manner. Always rewarding to visit this blog. Best of luck, George, and don't be daunted. I definitely think this review consisted of several rants gone too far. Was this attack sparked by the creator's unintentional reminder that perhaps the review time line needed speeding up? Probably so. While I agree that you are entitled to your opinions, which you have definitely made clear, and you are entitled to comment however you wish, on this, your "professional" review site, I am happy to announce that I do not share in all of your critiques of this site. I found Addanac City and its characters to be quite funny. Some strips more so than others, but I can say, with confidence and enthusiasm, that there is something here for everyone. I think you missed the point here, in regard to your "Sunday Morning Funnies" reference. I believe the creator is successfully attempting to recapture that old school feeling of those funnies we grew up loving. I LOVE the art style! It's reminiscent of Fred Hembeck's work-very colorful and those eyes . . . ! Remember? Updating this site five days a week takes a lot of commitment and shows love for what he is doing. I definitely commend him for that, especially when many of the sites I visit take weeks and months to post new comic strips. There are so many people who become discouraged and go on hiatus. I pray that this will not be the case with this artist, because I feel that there are many people who will enjoy the brand of humor Addanac City has to offer. I pray that he will be able to benefit from your review and from the reviews of others, as his gracious nature would suggest. Despite the harshness displayed here, there are several other critics who share an appreciation for Addanac City. All I can say to anyone reading this response . . . This artist has a lot of potential, so take the time to check out Addanac City for yourself. Opposing views are more than welcome, I love to have differing points of view balance things out. I don't think the overall bad impression was the reminder, but just the overall presentation and marketing of the comic. Like I said in the review with the analogy of the kebab shop with the 3-star Michelin tag, I like kebab (even if it did give me food poisoning in Bangkok), but the marketing turned me off and the resulting impression was bad even when the actual product wasn't that bad at all. I did have another read through, it's not as bad as I remember even if (maybe I'm just a little bit jaded when it comes to comics) I still don't really like it. And I have to say that George has been really gracious and admirable in the way he's received the criticism. He's gone and revamped the site according to the feedback, it really is a great improvement! Like Bengo says: He has the potential to go far. I suspect I might have been a bit too harsh, but like I said, I tend to let myself go more when people specifically ask me for criticism. Also TJ, I'm not a professional reviewer and Webcomic Finds has no intention of being a "professional" review site. I do this for fun and myself only. I hope all is well with you and yours. 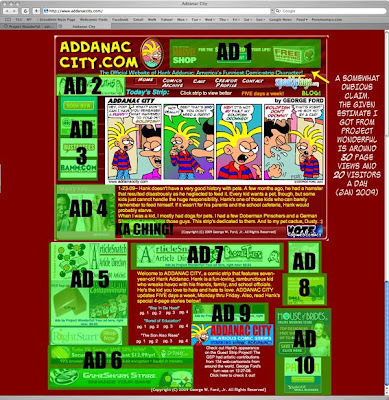 I just wanted to let you know that I've given my Addanac City website an Extreme Makeover to coincide with my 200th comic strip. Hopefully, it's easier to navigate and more pleasing to the critical eye. If you get a chance, check it out.